The Educational Ecosystem 2015 Survey, sponsored by Pew Research Center, obtained telephone interviews with a nationally representative sample of 2,752 adults living in the United States. 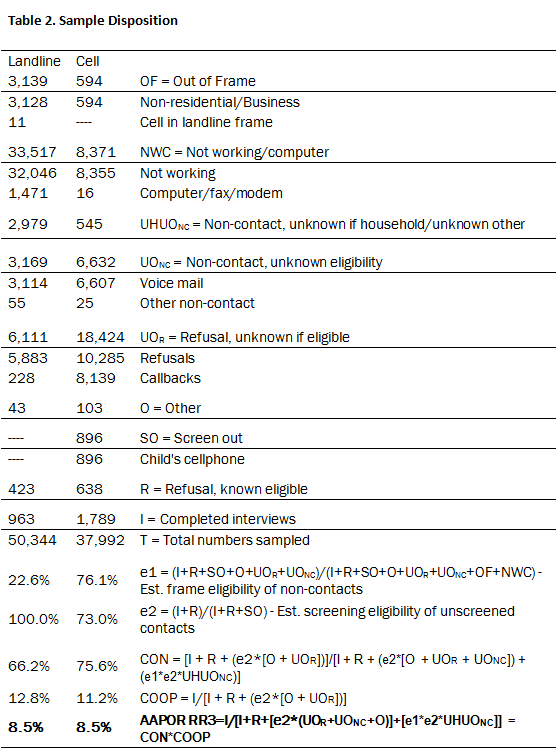 Interviews were conducted via landline (nLL=963) and cellphone (nC=1,789; including 1,059 without a landline phone). The survey was conducted by Princeton Survey Research Associates International (PSRAI). The interviews were administered in English and Spanish by Princeton Data Source, LLC from Oct. 13 to Nov. 15, 2015. Statistical results are weighted to correct known demographic discrepancies. The margin of sampling error for the complete set of weighted data is ±2.1 percentage points. For results based on Internet users8 (n=2,428), the margin of sampling error is ±2.3 percentage points. A combination of landline and cellular random-digit dial (RDD) samples was used to represent all adults in the United States who have access to either a landline or cellular telephone. Both samples were provided by Survey Sampling International, LLC (SSI) according to PSRAI specifications. The first stage of weighting corrected for different probabilities of selection associated with the number of adults in each household and each respondent’s telephone usage patterns.9 This weighting also adjusts for the overlapping landline and cell sample frames and the relative sizes of each frame and each sample. Table 2 reports the disposition of all sampled telephone numbers ever dialed from the original telephone number samples. The response rate estimates the fraction of all eligible sample that was ultimately interviewed. Response rates are computed according to American Association for Public Opinion Research standards.12 Thus the response rate for both the landline and cellular samples was 9%.